Known for her ladylike style, Ruth Langsford’s latest outfit as the presented Loose Women was no exception. Bringing a little sunshine to the studio, she added a bold pop of colour to her look with a yellow jumper. Adding a little extra interest to the otherwise plain knit with a soft bow neckline, Ruth let her jumper take centre stage by teaming it with a simple pair of black cigarette trousers and playful leopard print heels. But there may be a little more to Ruths fashion choice than meets the eye. Chances are Ruth’s ladylike look was inspired by none other than the Duchess of Cambridge. Not only because of the no-fuss styling, but also as her knit is from LK Bennett, one of Kate’s favourite labels. The Duchess has been a loyal LK Bennett customer for many years, and is often seen wearing their cult court shoes. She was even spotted wearing a pair of heeled black ankle boots by the brand as recently as this week. Always classically elegant but with a fashion forward twist, LK Bennett’s ethos fits perfectly with the Duchess’ signature style. And if it’s good enough for Kate, then it’s good enough for us! Priced at £150, Ruth’s jumper is certainly an investment purchase, but the super-soft cashmere blend helps justify the price tag. 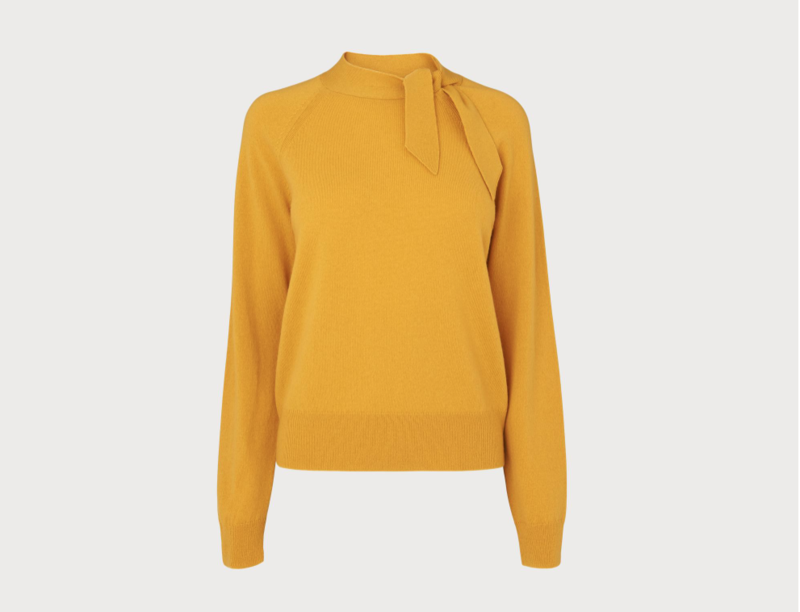 Thanks to it’s lightweight composition, it’s easy to tuck into skirts or trousers, whilst the sunny yellow shade will both brighten up a dreary winter day and see you through spring. Follow Ruth’s lead by playing it down with low-key pieces, or push the fashion boundaries by wearing your knit with a printed skirt or colour-clash with bold blues or vibrant pinks. Fans went wild for Ruth’s look – taking to Instagram to show their appreciation. We can’t wait to see what she wears next.